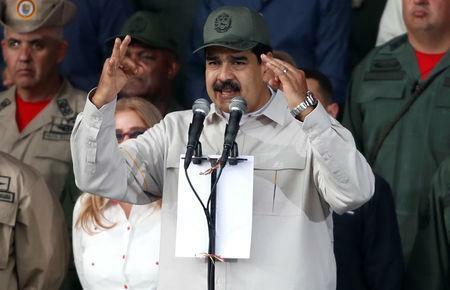 CARACAS/MARACAIBO (Reuters) - Venezuelan President Nicolas Maduro on Saturday ordered an expansion of civilian militia by nearly one million members as opposition leader Juan Guaido toured western Zulia state, which has been hard hit by electricity blackouts. Guaido, the leader of the opposition-controlled National Assembly who in January invoked Venezuela's constitution to assume an interim presidency, has called on the military to abandon Maduro amid a hyperinflationary economic collapse made worse by several nationwide blackouts in the past month. Guaido has been recognized as Venezuela's rightful leader by the United States and most Western countries, who agree with his argument that Maduro's 2018 re-election was illegitimate. 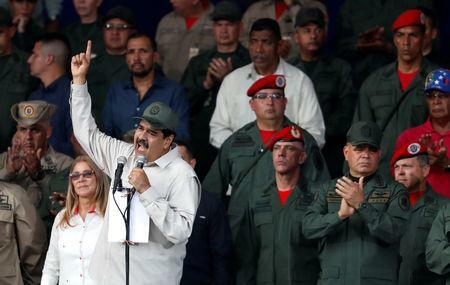 Maduro, who calls Guaido a U.S. puppet, said he aimed to raise the number of militia members to three million by year-end from what he said was more than 2 million currently. Maduro has encouraged them to become involved in agricultural production. Shortages of food and medicine have prompted more than three million Venezuelans to emigrate in recent years. "With your rifles on your shoulders, be ready to defend the fatherland and dig the furrow to plant the seeds to produce food for the community, for the people," Maduro, a socialist, told thousands of militia members gathered in the capital Caracas, wearing khaki camouflaged uniforms. So far, the military top brass has remained loyal to Maduro despite Guaido's offer of amnesty to military members who switch sides. 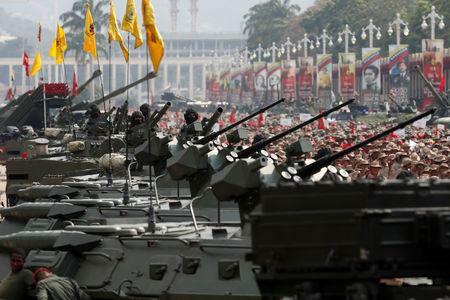 Hundreds of soldiers have sought asylum in neighboring Colombia. While electricity has largely been restored in Caracas, Maduro's administration is rationing power to the rest of Venezuela. Guaido is traveling in the interior to drum up support. In Zulia state, the site of the OPEC member's first oil well and home to Venezuela's second-largest city, Maracaibo, he said: "We are here to check on the situation, your suffering. But Zulia will rise up." Rights groups say Venezuelan authorities have arrested over 1,000 people after anti-government demonstrations this year. Guaido's chief of staff was arrested last month.